Wayne Gapp – The last race? 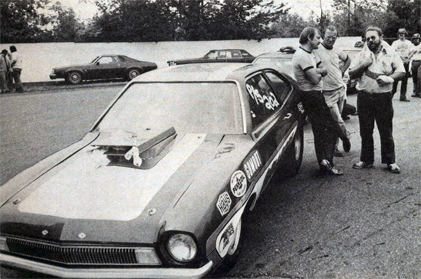 In the summer of 1977 the AHRA (American Hot Rod Association) held the AHRA Grand Nationals at Dragway 42. As far as I can tell this is the last drag racing event that my Dad won. 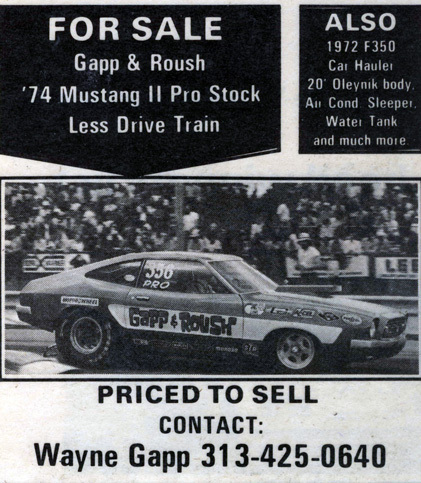 Wayne Gapp returned to the driver’s seat of the Gapp & Roush Pinto at the Grand Nationals and pulled off an upset win over the Team Jenkins Monza and driver Larry Lombardo. Gapp hit an 8.92, 153.32 while the quicker-runner Lombardo fell to broken drivetrain not far off the line. Wayne Gapp (leaning against his Pinto) chats with Bill “Grumpy” Jenkins prior to the opening round of Pro Stock. 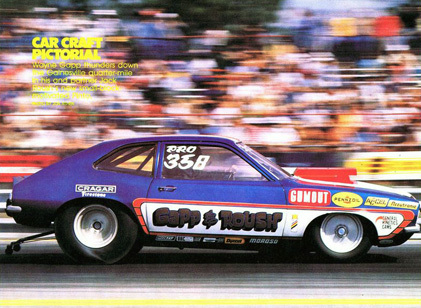 Larry Lombardo was the pace-setter with the “Grump’s” Monza at a sizzling 8.71, 160.42 mph clip, but it was Gapp who ended up in the winner’s circle. Looks like the 1973 Pinto is operating here. I’m a little confused by that and the lack of numbering on the car which would give me the year. Anyway, some cool images of G&R cars + other competitors. Driving those Hemi powered Colts looks like a good way to get yourself killed. This image was taken by Jon Asher and appeared in Car Craft magazine in mid 1976. Shot at the NHRA event at Gainesville and it was probably the first time that this car was at a national event. Digging through the archives and found some 8mm and Super 8mm film. I had it moved to DVD and this was the first video. I almost fell off the couch! Poor quality but probably the only video in existence of this vehicle running at the time. This film was taken after the car was sold to Drake Viscome as the car is painted up in the ‘Vindicator’ livery. Found this on eBay awhile ago. I believe that Jack Roush now has this car…or I should say the Roush Museum.